It was a sudden light show. I moved from tree space to tree space watching it play out; where was the strongest sensation, what made me gasp? A few steps into the next pairing I saw the shadow of a man who was nearby, fall on the trunk of the cypress, and it was a sudden jolt of a new possibility. There were others too, of the trees alone, and some are strong on their own, but this one made its way into the considerations for this blog. maybe on another day I would feel differently. Photography is like that. 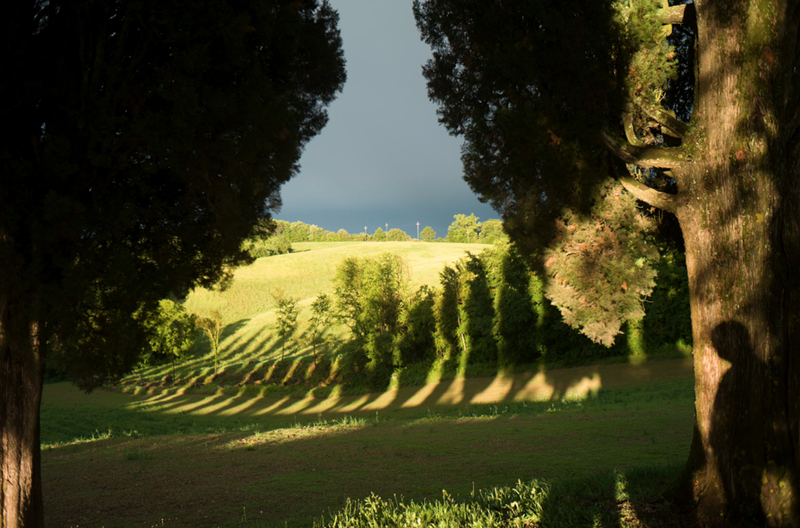 This entry was posted in Evening light, Trees, Tuscany, Uncategorized and tagged Landscape, Light, Trees, Tuscany on May 25, 2015 by joelmeyerowitz2014.